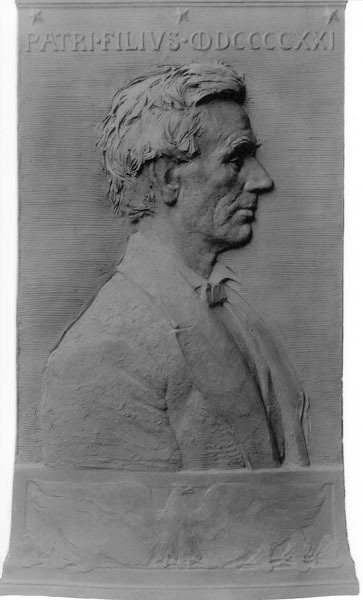 Original clay plaque of Abraham Lincoln (1921-22) by sculptor Frederick Warren Allen. Bronze cast for N.E. Historic Genealogical Society. Who would have known that Abraham Lincoln‘s lineage goes back to the 1630’s in New England? His son, Robert Todd Lincoln did and, attaching a sentimental value to those origins, funded this very fine memorial to his father to be placed in the New England Historic Genealogical Society‘s building when it was at Ashburton Place in Boston. The commission came to Allen through Paul Wayland Bartlett, an American sculptor who was his teacher in Paris. It was unveiled on May 31, 1922, the day after the dedication of the Washington D.C. Lincoln Memorial sculpted by fellow Concord resident Daniel Chester French. French had registered praise for Allen’s work eight years before when he was a young sculptor. Four years later the seated Lincoln Memorial by Augustus St. Gaudens was unveiled in Chicago. Allen was a humble man and had always been reticent about receiving public praise for his art saying that if his work was good, it would speak for itself, so he had not attended the unveiling. 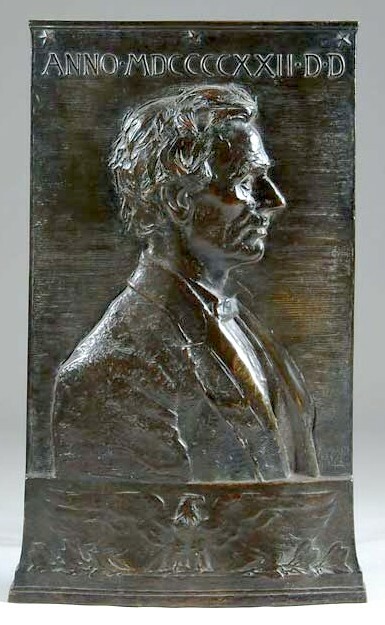 Final Bronze of Lincoln (1922) by Frederick Warren Allen, a gift of Robert Todd Lincoln to the New England Historic Genealogical Society. The legacy that Allen inherited from those who influenced him was not only from the elder sculptors Daniel Chester French (1850-1931), and Augustus St. Gaudens (1848-1907), and Bela Pratt (1867-1917), but also from Paul Wayland Bartlett (1865-1925), his teacher at the Académie Colarossi in Paris, who brought him the commission for this important historical portrait. Barlett was president of the National Sculpture Society from 1917-1919 and a master of his art. St. Gaudens was an innovator in the new American expression in sculpture and used bas-relief for the eagle on the back of the chair of his Lincoln statue. 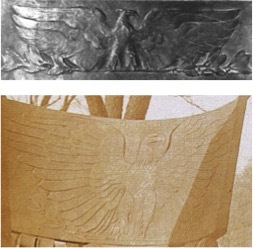 It seems that Allen knew that Standing Lincoln (1887) and used the idea of the spread eagle on the base of his own portrait relief. The eagle is a fitting symbol of the power and authority of the Presidency. In both sculptures, it has spread wings with a stylized parallel horizontal feather arrangement. In both, the eagle’s head is turned toward its left and claws clutch olive branches, a symbol of Lincoln as peacemaker. Below an uncomplicated crown molding and above Lincoln’s head are three stars, a symbol used on the American flag. A lettered heading below the stars is the year the sculpture was created in Roman numerals and Latin words. 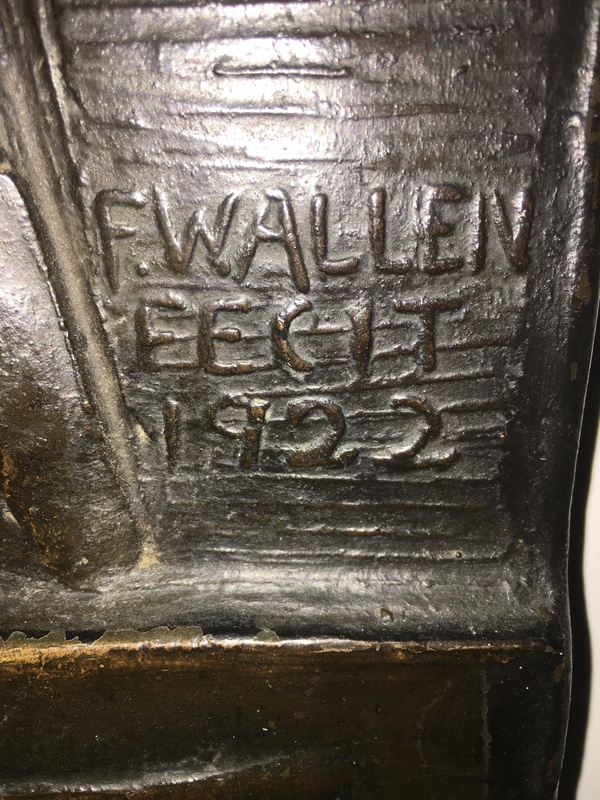 The eagle portion of the plaque is at the base, protruding outward slightly from the portrait above it and flaring at the bottom on a simple footing. A lettered heading, pertinent symbols and a broad base were elements often used by St. Gaudens in his portrait work emulated by Allen here. Note the difference in the header between the original clay and the final bronze. In the original, the lettering and date, PATRI.FILIUS.CD DCCCXXI was corrected to read ANNO.MDCCCXXII D.D and was reformed in a larger size. It was common in St. Gaudens’ relief work to use what looked like brush strokes, as if he were “painting” with clay. Allen uses this same effect in the textured background with a horizontal dry-brush effect. 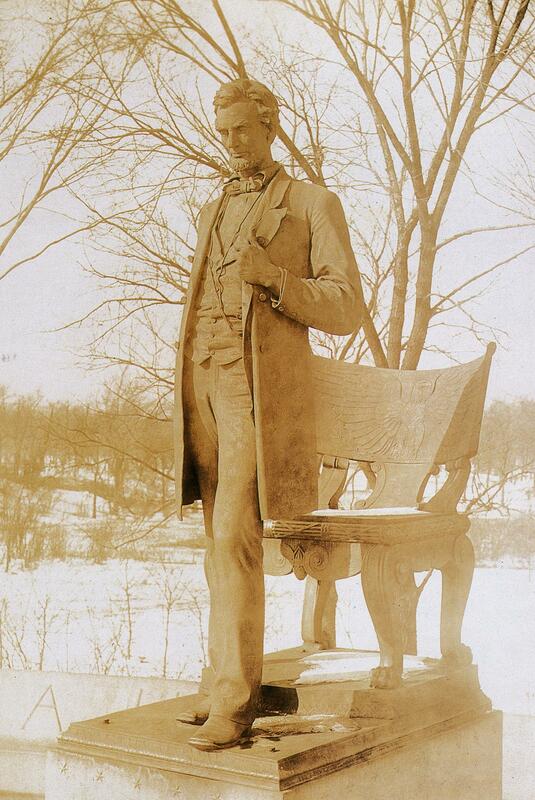 Standing Lincoln (1887) by American sculptor Augustus Saint-Gaudens (1848-1907). Detailed comparison of eagle bas-relief. Top: Abraham Lincoln (1920-22) by Frederick Warren Allen. Bottom: Standing Lincoln (1881) by Augustus Saint-Gaudens. Provenance: New England Historic Genealogical Society, Ashburton Place in Boston, sold at auction after the move to a new building because it was too heavy to hang on the wall. Located in a private collection. Publications: New England Historical and Genealogical Register, Volume 76 in July 1922 on the frontispieces and in a chapter by Henry Fitz-Gilbert Waters entitled “The Lincoln Memorial”. Inscriptions: ANNO MDCCCCXXII D D. Clay original is inscribed PATRI FILIVS CDDCCCCXXI and bears no signature.